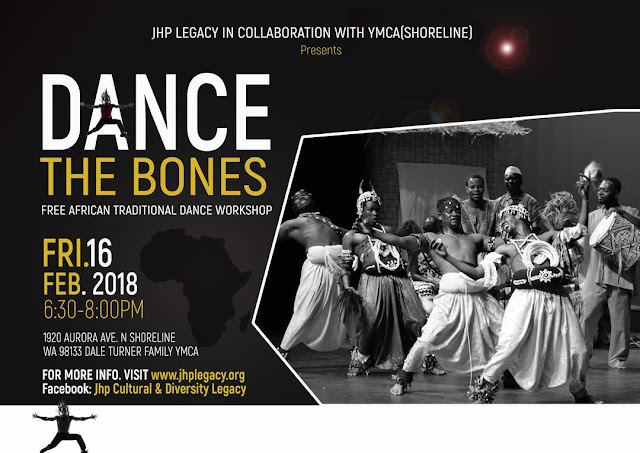 JHP Cultural and Diversity Legacy in collaboration with Dale Turner YMCA in Shoreline presents 'Dance the Bones,' a FREE African Traditional Dance Workshop. JHP Legacy believes that the increment in our overall bone density, strength, balance and coordination is ascertained by highly concentrated exercises! As part of our vision, we want all and sundry to learn at least one Traditional Dance each year, We will be learning a Social Traditional Dance called "Kpatsa" from Ghana. Come DANCE [Exercise] THE BONES on Friday, February 16, 2018 6:30pm-8pm at Dale Turner YMCA, 19290 Aurora Ave N, Shoreline 98133.